What you are about to read is a list of some of the most common songwriting techniques that the big players in the industry use to construct their songs. Bear in mind that the title says “could.” There is still quite a bit more that goes into success. Looking good or interesting helps considering the mind-numbing shallowness of most the world. Having connections in the industry is a big plus – without contacts your chances of being struck by lightning are greater than your chances of being discovered! An intense amount of energy combined with a solid work ethic are essential for indie/DIY artists, and certainly help the well-connected. If you have any combination of these things, you have a pretty good shot. Now you need the last part – your songs! 1) Technique number one is the one that can get you into the most trouble – it’s Theft! Yes… some people, like Robin Thicke and Pharrell Williams, think this is a legitimate songwriting technique. They took an old song and wrote their own words to it. This, however, will almost always end badly! 2) I call technique number two Slight Alterations. This is just one step above theft. In this technique the songwriter takes a hit and changes some element. Two examples jump immediately to mind. First, check out Rihanna’s “Shut Up And Drive” and compare to New Order’s “Blue Monday.” She kept the chords and melodies the same but altered the instruments and words. The second example is Sam Smith’s “Stay With Me” as compared to Tom Petty’s “I Won’t Back Down.” In this example, Smith slowed the tempo, changed the instruments and words, but still had to pay Petty money for copyright infringement despite the fact that he arguably created something new and many feel, better! 3) The third technique is Deconstruction/Reconstruction. This is reportedly what Nickelback’s Chad Kroeger does. OK Go! seems to have done this obviously with “Here it Goes Again” from Billy Joel’s “Still Rock and Roll to Me” because the chord progressions and song structure are almost identical! In this third technique, the songwriter takes an already existing hit song, takes it apart, analyzing chords, rhythms, melodies, textures, and makes a blueprint based on the song, from which a new song could be built. Artists that use this technique pay close attention to the details, and though they sometimes alter the song quite a bit, they try to capture the recipe that made the original song a success. It’s difficult to find a direct example of this method, but if you want to learn more about it, I describe the method in greater detail here! Unlike the first two techniques, and despite my disdain for some of the artists who claim to use this one, I don’t believe this technique is that bad and could actually yield some original stuff. An example of this at a micro-level is Bruno Mar’s “Uptown Funk.” These guys did a great job at finding many of the influences that led to the travesty, and huge hit that Uptown Funk has become. Bruno and Mark Ronson didn’t just pull two or three different parts together, they took riffs, melodies, rhythms, and chord progressions from dozens of songs, and like building with musical legos, they put a new song together that sounds completely familiar, though it’s tough to put your finger on why. The lyrics are often built in the same way from cliches. Unlike the barbaric technique used by Kid Rock, Bruno and Mark Ronson are master thieves, stealing little bits from here and there and putting them together in such a way that they most likely won’t get sued. 5) The fifth technique is Stylistic Imitation. This is what Bruno Mars did with “Locked Out of Heaven” which he proudly admits sounds like a Police song. Using this technique, the songwriter needs to listen to a lot of music from a particular artist and get to know their style – growing up listening to an artist makes it all the easier. Once the sound of the artist has been absorbed, a new song is created from elements of the original artist. This is different from all the rest of the techniques so far because the result could very well be a brand new song – musically original – in the style of another artist. 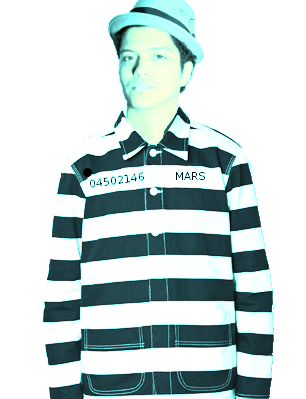 Listening to Locked Out of Heaven, it sounds like Bruno wrote an original Police song, not a Bruno Mars song. 6) The last technique I’ll mention here is the Art of Simplicity. It seems too easy. Play two or three chords and sing a few notes from the pentatonic scale, and you could have a hit. Most people, especially non-musicians, like to avoid challenge when it comes to listening to music. Adele’s “Rolling in the Deep” is a perfect example. Maroon 5’s “Moves Like Jagger” is another. There are thousands more… seriously, just pick two chords and fool around. You’ll be surprised what you can write! This just scratches the surface. There are many more techniques to use, including revisiting the standards like the blues, old time rock and roll or country, or even dipping into classical music. I have a list of the top ten chord progressions in pop and rock. Any of these chord progressions are fair game and are immediately familiar. The best technique, in my opinion, is to write music you want to hear, really follow your heart. This is what art is all about, after all. You could be a brilliant songwriter using the techniques listed above, but you might never be an artist.